Figure 1. The gold-foil experiment. Figure 2. Thomson's currant bun atomic model. Figure 3. 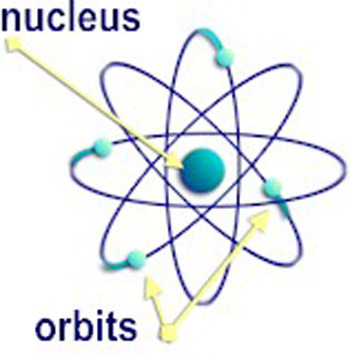 Rutherford's atomic model (nucleus and electron orbits not to scale). 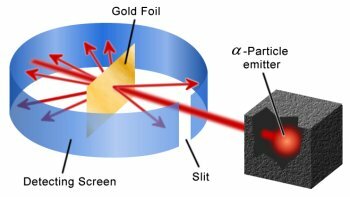 In 1909, two researchers in Ernest Rutherford's laboratory at the University of Manchester, Hans Geiger and Ernest Marsden, fired a beam of alpha particles at a thin metal foil. Alpha particles had been identified and named (they were called "alpha rays" to begin with) a decade earlier by Rutherford, as one of the types of radiation given off by radioactive elements such as uranium. Being fast-moving and positively charged (they're now known to be high-speed helium nuclei), Rutherford reasoned they'd serve as a good probe of the atomic structure of matter (see Figure 1). According to one popular theory at the time, championed by J. J. Thomson, atoms were built along the lines of currant buns – with electrons (particles carrying negative charge) for currants and a smeared-out positive charge for the rest of the bun to keep the whole thing electrically neutral (see Figure 2). If the currant bun model were right, every one of the alpha particles ought to zip straight through the thin foil in Geiger and Marsden's experiment suffering, at most, minor deflections because of the weak influence of the spread-out positive charge (the effect of the electrons being negligible). What Geiger and Marsden actually found was stunning. Most of the alpha particles did indeed travel straight through the foil with little or no deviation. But a small fraction (about one in ten thousand) rebounded, ending up on the same side of the foil as the incoming beam. A few were returned almost along the same tracks as they went in. Rutherford described hearing of these rebounds as the most incredible event of his life. It was, he said, "as if you fired a 15-inch shell at a piece of tissue paper and it came back and hit you." Such huge deflections could mean only one thing: some of the alpha particles had run into massive concentrations of positive charge and, since like charges repel, had been hurled straight back by them. Thomson's currant bun model of the atom, in which positive charge was spread thinly over the whole atom, hadn't a hope of explaining the results. 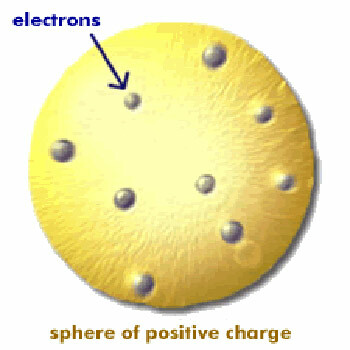 Instead, in 1911, Rutherford cooked up a new model of the atom in which all of the positive charge is crammed inside a tiny, massive nucleus about ten thousand times smaller than the atom as a whole (see Figure 3). That's equivalent in scale to a marble in the middle of a football stadium. The much lighter electrons, he assumed, lay well outside the nucleus. To the shock and amazement of everyone, the atoms of which planets, people, pianos, and everything else are made consisted almost entirely of empty space. Rutherford's nuclear model of the atom was a huge step forward in understanding nature at the ultrasmall scale. But even as it closed the casebook on the alpha particle experiment, it threw open another one. Since the nucleus and its retinue of electrons are oppositely charged, and therefore attract one another, there didn't seem anything to stop the electrons from being pulled immediately into the nucleus. Throughout the universe, atomic matter ought to implode in the wink of an eye. Rutherford countered by saying that the atom was like a miniature solar system: the electrons circled the nucleus in wide orbits just as planets orbit the sun. This is the picture of atoms that most of us still carry around in our heads. It's an appealing, easy-to-grasp image – one that's inspired many a logo of the atomic age. Yet theorists were well aware of its shortcomings right from the start. The fatal flaw in Rutherford's model is that it contains charges that are accelerating. The charges are on the electrons and the acceleration is due to the electrons always changing direction as they move around their orbits. (Things accelerate when they change speed and/or direction.) Since Maxwell's time, scientists had known that accelerating charges radiate energy. What was to stop the orbiting electrons in Rutherford's atom quickly (in fact, in about one hundred-millionth of a second) losing all their energy and spiraling into the nucleus? The answer came from a young Dane, Niels Bohr, who joined the team at Manchester for a six-month spell in 1912, shortly after Rutherford went public with his new vision of the atom. Bohr played a hunch. He knew about Planck's quantum. He knew there was no way to save an electron inside an atom from plummeting into the nucleus if it could give off energy continuously. And so he said simply that electrons inside atoms can't radiate continuously. They can only radiate in lumps, and these lumps are the same as Planck's quanta. For a given type of atom, say hydrogen, there's a limited number of stable orbits that an electron can occupy. Each of these orbits corresponds to a whole multiple of the basic quantum. As long as an electron is in one of these orbits, its energy, contrary to whatever classical physics might say, stays the same. If it jumps from an outer (higher energy) orbit to an inner (lower energy) orbit, the energy difference between the two is given off as a quantum of light. Once the electron reaches the lowest energy orbit, it can't fall any further and is safe from the clutches of the nucleus. For more on this, see the encyclopedia article on the Bohr atom.